Death is not natural for a state as it is for a human being, for whom death is not only necessary, but frequently even desirable. For one day spent well, and agreeably to your precepts, is preferable to an eternity of error. He departed, he withdrew, he strode off, he broke forth. It is besides necessary that whoever is brave should be a man of great soul. This is the part of a great man, after he has maturely weighed all circumstances, to punish the guilty, to spare the many, and in every state of fortune not to depart from an upright, virtuous conduct. For if that last day does not occasion an entire extinction, but a change of abode only, what can be more desirable? And if it, on the other hand, destroys and absolutely puts an end to us, what can be preferable to having a deep sleep fall on us in the midst of the fatigues of life and, being thus overtaken, to sleep to eternity? Old age: the crown of life, our play's last act. Nothing stands out so conspicuously, or remains so firmly fixed in the memory, as something which you have blundered. I wonder... that a soothsayer doesn't laugh when he sees another soothsayer. 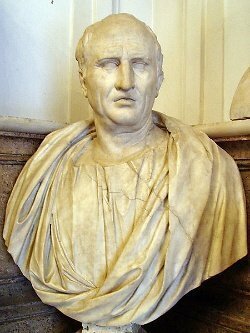 Bio: Marcus Tullius Cicero was a Roman philosopher, politician, lawyer, orator, political theorist, consul, and constitutionalist.